Hi kids! Captain Pump here. Welcome to the beginning of a wonderful journey we are going to take together. I am so pumped! Together we will visit a place where fitness and healthy living are the way of life. A place where everyone is encouraged to be who they are and thrive. 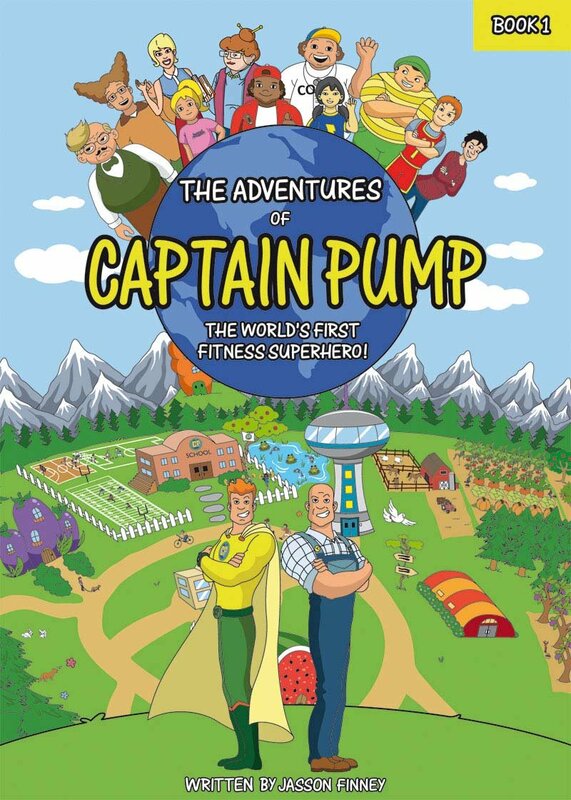 Welcome to the Adventures of Captain Pump – The World’s First Fitness Superhero…That’s me! I’m so thrilled that you have your very own copy of my book. Now together we can go on great adventures, get fit and become healthy in every way! My writer, Jasson Finney, did a pretty good job telling my story and let me tell you, I have a lot of stories. I’ll tell you more about him later but first I want to make sure that you understand the book and what the different colored pictures and logos mean. Throughout the book we jump back and forth between the real world and the magical world of Pumpland. You will notice there are black and white pictures and color ones too. The black and white ones tell us we are in the real world - your world - in a town just like yours. The color ones tell us we are in my world - Pumpland! Same thing with the logo in the upper right corner on each page - black and white for the real world and color for Pumpland. Get it? At the end of each book is what I call Captain’s Corner. This is where you and I recap the adventure and talk about the lesson. I love going over the important things to remember and helping you really understand what each one is about. There is also a section called Captain’s Gym which is divided in 3 phases. Phase 2 is where I suggest exercises and show you how to do them right. Phase 3 There is also Captain’s Cupboard where we talk about healthy food and what you should eat always save the day the healthy way. Finally I give you my final words and offer encouragement so you know I am here for you as we go through this journey together. How we get back and forth is for you to find out by reading book 1. Yes there will be many, many more Captain Pump books. Remember I said we are beginning our journey together. I’ll take you on the tour now. Oh yeah! What’s in bold are excerpts from the book. So if you have yours, you can find what page the quote is from. Cool? OK. Let’s get started. My story starts with a janitor and a dream. His dream is to make kids fit and healthy but he doesn’t know how. That’s where I come in. “George, you wished you could find a way to help the kids . . . well, here I am. Together we are going to help these amazing young people become fit, healthy, and confident so they can be better at everything they do for years to come,” announces Captain Pump. George Basner is the janitor of County Public school. He has always lived a fit life. It is simply what he does. To eat healthy and to exercise are part of his daily life, habits that he learned long ago when he was a young boy. He continues to practice these habits until this very day, just like I do. Like many of us, George had good intentions but lacked the knowledge of how to help others adopt healthy habits and lifestyles. He struggles seeing so many students developing poor eating habits and doing very little exercising. Me too. That really makes me sad and I hope you inspire you to choose to live a fit and healthy life. You see, for almost everyone at the CP school, George is just a guy who pushes a broom and takes out the garbage. Like so many of us, he goes unnoticed, invisible to most. He is the classic underdog who isn’t taken seriously - especially by Ms. Barkelott, the CP elementary principal. She’s tough. Principal Barkelott doesn’t place much importance on physical activity and sports. As a result George must convince her that being fit is just as important as getting good grades. But there is one teacher who sees so much more in George than someone who just keeps the halls clean. I think she is awesome! Her name is Ashley Johnson, the soft-spoken English teacher who knows George has much more to offer. George and Ashley worry about the kids. But they just don’t know how to help them. George is especially troubled by what he fears what will become an epidemic of unhealthy kids. Yes, George is right about that. You see kids, your body can be your best friend if you treat it right. That means giving it healthy food to make your bones strong and develop muscle that will give you the ability to run faster jump higher and have more energy. It wasn’t always easy for George to make healthy choices or go the gym and exercise regularly. Like everyone else, sometimes he just didn’t feel like doing it. Sometimes I even get lazy but I remind myself how important it is to treat my body right. After all, what good is an out of shape fitness superhero? Hahaha! That is the key my friends - Perseverance! Doing something on a consistent basis will make you better and better at what you remain consistent. George didn’t become fit and muscular overnight. He spent years being consistent with his training and healthy eating - and you can too! In fact, you have an advantage over George. When he was growing up he didn’t have a magical healthy land to help him along his journey and a fitness superhero to guide him along the way. So, in reality, you have a better chance than he did of becoming fit and healthy for a lifetime. You have the magic and wonder of Pumpland and you have me - Captain Pump! Now let’s talk about Pumpland - my home. This is a magical land where everyone is fit, healthy and kind to each other. No matter where you go in Pumpland, you will see people living an active lifestyle. I am a Fitness Superhero to everyone no matter how old or how young you are, no matter what you like or where you are from. Here you will find so much to do and so many places to see. There is always a fun adventure going on here for you to enjoy. Fit and full of pep ready to help kids all over become fit, confident, strong and kind to each other. A jovial janitor who cares about the kids’ well-being and who would love to see students of the CP elementary school adopt more healthy lifestyles. The principal of CP elementary who is a stickler for discipline and believes that gym and sports should take a backseat to scholastics. The sweet English teacher who also cares about helping the kids but like George, has no idea how. The mousy math teacher who wears a toupee and agrees with Ms. Barkelott’s ways. The quirky science teacher who is always looking for the next experiment to teach the kids. The school coach who values his athletes and wants to win the state championships despite the obstacles imposed by principal Barkelott. The class clown who is always getting into some kind of mischief and loves junk food. The owner of Snacks corner store where the kids of the CP school like to hang out and get their junk food and sugary snacks. The captain of the football team, Nathan works hard and is a good student. The captain of the soccer team. She is dedicated to her sport and her fellow athletes. Captain of the basketball team who is always butting heads with Guido and Myron. The cute nerdy wiz kid who is an academic genius but not very good at gym or sports. A villain who vows to make all of Pumpland addicted to his sweet yet sour ways. A lovely singing bluebird who regularly visits Captain Pump. I have a big announcement…Breaking News as they say HAHAHA! Soon we will be introducing a brand new Captain Pump website that you will be able to use in school with your teachers and at home with your family and friends. I am so pumped to tell you about this amazing website. It’s a game!! Yes a game where you will learn about sports, nutrition, exercise. It will also teach you about marine life, how to take care of the environment and the animals that live in the Pumpland forest. That’s not all. You will also learn about the different countries and cultures in your real world. And most of all, you will learn how to be kind and accepting of each other. It’s going to be amazing! Jasson and his team are hard at work putting it all together. He told me that the site just keeps getting bigger and better! It’s going to make this fitness superhero pumped for sure! Jasson here. I am so happy to see you all here. Captain Pump and I want to thank you for coming into our world and allowing us to share with you the wonders of The Adventures of Captain Pump. The reason I wrote this book series is because, just like Captain Pump, George and Ashley, I want to help kids become fit and healthy. I want to inspire kids to make healthy choices and become more physically active. Most of all, I want kids to have fun when they read the Adventures of Captain Pump! I myself was always active and was a good athlete. I excelled at any sport I played, and always wanted to get better. When I was a kid, I used to make my own training camps in the off seasons – setting up obstacle courses and drills in our yard. At the age of 9 I turned the garage into a makeshift gym. We organized neighborhood sport leagues for the kids in the area. I love helping people make life-lasting changes and adopt healthy lifestyle habits. I started training people when I was a teen and have had the opportunity to work with people from all walks of life, ages and backgrounds. Today I am still doing it. Just like Captain Pump, it’s my passion. It’s both rewarding and fulfilling and makes me feel good to know I am making a positive impact on people’s lives. The Captain Pump books are filled with storylines that will empower young readers to make healthy choices just as Captain and his “pumpster” crew do in Pumpland. My hope is that George’s enthusiasm and amazement is contagious and every person who reads The Adventures of Captain Pump series feels like they have found a friendly place where they are welcome and are encouraged to Save the Day the Healthy Way! I am also an actor. I have had the privilege of working on great TV and film sets with so many actors over the years. I feel very blessed and look forward to bringing Captain Pump and the Pumpland crew to a screen near you. More on that to come. You can find more information on me at the following websites. Thanks so much for joining us on this wonderful journey to health and fitness. Here are the last word from Captain Pump. "It's mature enough to make sense, yet understandable to the younger children who might enjoy it. This book would fit well in any school library, any gym, or on any kids bookshelf. " Let us know your email address and we'll make sure you know what is new in Pumpland!